Copy Cat On A Bike! What Is The Life You Want? Are You Ready To Let Yourself Go? Tee For Him and Giveaway Winner! Beach Ready...Cute As A Peach! Big Day Dress Dilemma...Keep it or....? How does "Porch Swing" sound? Intrigued?...Lemonades and juices are great for the daytime...but a little bit of Gin, Pimm's and a whole lot of homemade lemonade mixed with cucumbers is perfect as a drink after a long day....Sound refreshing? I am going to test it over the weekend :) We all need little indulgence from time to time :) Right? For the whole recipe head over to the lovely Smitten Kitchen. looks so yum!! 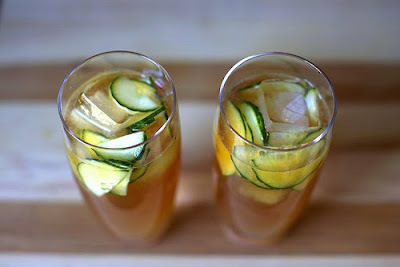 i just had pims for the first time a couple weeks ago -- so yum!! Oh, looks so very refreshing!!! Oh my goodness! That looks so amazing that I might just HAVE to whip it up on my new porch tonight. Thanks for the recommendation sweets! looks good! I love Lemon in everything!!! Thanks for the get better wishes. This drink looks fantastic. I'm not a big fan of cucumber but I think this could turn me! this sounds so perfect for today's brutal heat. I drink these ALL the time! YUMM!!! Yum to both yours and the SK one. Gotta love those cocktails! this sounds like a perfect summer drink . . . which makes me wish I didn't hate gin with a passion! YUP!!!!! It looks so good!!! Oh yes this is a summer must make! This looks like summertime heaven in a glass! I love a good gin and tonic or martini... so I shall make these this weekend! My best friend is coming home to visit so this will be perfect when us girls get together! Seriously looks and sounds DELICIOUS!!!! Sounds absolutely delicious! I want to make it right now - it's sweltering here! I love any drink with gin and cucumber! It's a recipe for success in my book. Those drinks look delish; NYC heat has left me parched and I wish they could magically appear right now! Looks great to me...anything refreshing to help deal with this stubborn heat..Beautiful images! I am absolutely smitten by Smitten Kitchen these days! Going to check out your ginger lemonade recipe too. That sounds delish! Sounds like a fab summer drink! I'd love one! sounds like the perfect thing to do right about now!! oooo sounds amazing! i LOVE cucumber in water. it's the weirdest thing ever but it's so refreshing and perfect for summer. btw i just wanted to thank you for consistently supporting my blog :) i don't have any idea how you have so much time to look at my clueless and random wanderings/ rants / photos but i really do appreciate it. Lemonade and a porch swing sound perfect right now! 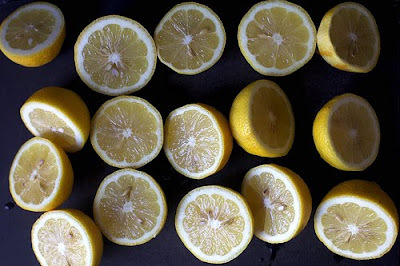 THANK YOU for sharing your ginger lemonade recipe! It sounds sooo delicious. They sound really good, except gin makes me cry lol! Oh and I probably need it to be summer in New Zealand to be able to enjoy one. You'll just have to have one for me! This looks fantastic! I want to try this too this weekend after Helena shared it with me! I'm so intrigued by this whole Pimm's thing...!